While the war in the Middle East rages on unabated, taking its deadly toll on innocent lives and ravaging Lebanon, President Bush went to his Crawford ranch for his yearly vacation. He cycled, rode, kicked back, enjoyed his summer r and r, and perhaps reflected upon his plummeting popularity in the polls and loss of some supporters in his own party. Then along came the news about the foiled alleged British bomb plot and Bush, revitalized, seized this as an opportunity to pound away at his critics. He reminded Americans about 9/11 and spoke about America's war with the "Islamic fascists". You know, they are those Arab fundamentalists who hate the U.S. because of their love of freedom and democracy. By the way, the newly-coined term "Islamic fascist" or "Islamofascist" is an oxymoron. You can be either "Islamist" (Islamic) or "fascist" but you cannot be both at the same time. One belies the other. US President George W. Bush seized on a foiled London airline bomb plot to hammer unnamed critics he accused of having all but forgotten the September 11, 2001 terrorist attacks. The London conspiracy is "a stark reminder that this nation is at war with Islamic fascists who will use any means to destroy those of us who love freedom, to hurt our nation," the president said on a day trip to Wisconsin. ...Read rest of article... (Common Dreams News Center). Tags for this entry: Bush, U.S.A., politics. Good Morning from Grand River. It's been a few days since Justice Marshall made his ruling that the contempt of court orders must be upheld, and that negotiations were to stop until the people and the barricades have been removed from the site. Obviously that created quite a stir within the Six Nations as well as within the town of caledonia. Tuesday night became a night of venting when residents of Caledonia came down and gathered within about 40' of the main entrance of the reclamation site. the people had gathered at the fire earlier in the evening and concensus had been reached that until such time as the Crowns representatives had officially stated that the talks were off, that we were going to continue toward the August 23rd date that had previously been set aside for talks to continue. Yesterday, the Israeli security cabinet authorized an expansion of the ground war in Lebanon (while its military suffered 15 dead and 25 wounded, the highest battlefield casualty rate thus far); Hezbollah leader Hassan Nasrallah threatened to "transform our land in the south [of Lebanon] to a graveyard for Zionist invaders" and called on Haifa's Arab residents to evacuate that city; Israeli planes bombed bridges and dropped leaflets warning that "any vehicle on the roads south of the Litani River" might be destroyed, while Hezbollah rained 100 or more Katyusha rockets on northern Israel. In Iraq, the Baghdad morgue released a staggering death toll for the month of July -- 1,815 bodies received (as many as 90% having died violently). As "a new high," this was an ominous sign of the spiraling civil war in the Iraqi capital, while in al-Anbar Province, heart of the Sunni insurgency, three more U.S. soldiers died and two Black Hawk helicopter crewmen were missing and possibly dead. In Afghanistan, the capital, Kabul, is now experiencing an energy crisis which has left its electricity levels at lows equal to that of occupied, embattled Baghdad; while, to the south, the country is experiencing an ever more intense guerrilla war, replete with Iraqi-style suicide bombers and roadside IEDs, led by a resurgent Taliban. These are but signs (along with rising energy prices) of the spreading chaos at the heart of what was once to be a Bush-administration-led American imperium in the Middle East (and energy-rich Central Asia). But this administration's top officials remain remarkably cloistered and undaunted. Only yesterday, according to the New York Times, Vice President Cheney "went so far as to suggest that the ouster of" Senator Joseph Lieberman by Ned Lamont in the Democratic primary in Connecticut, "might encourage ‘al Qaeda types.'" "The rest of the world might see the Middle East crisis as a cataclysmic event of potentially biblical proportions, but in his July 29 radio address the president echoed a persistent White House vision of hope rising from destruction. While taking care to note that the killing is ‘painful and tragic,' Bush sought to portray the tragedy as an opportunity for ‘broader change' that will lead to ‘peace,' ‘liberty,' ‘democracy' and a ‘more secure' America. Amnesty International reiterates its call for an immediate, full and effective ceasefire after civilian death highs. On Friday 5 August, at least 23 Syrian agricultural workers were killed by Israeli forces on a farm in the village of al-Qaa on the Lebanese-Syrian border according to various reports. This was the highest number of fatalities recorded so far in a single incident together with the attack on a building in Qana on 30 July. Over the past four days, rockets fired by Hizbullah from southern Lebanon at Israel are also said to have killed at least 14 civilians. These kinds of attacks by both sides have become part of an increasingly entrenched pattern which includes war crimes. Such attacks also make it urgent and imperative that Israel and Lebanon consent to an investigation -- of the pattern of attacks by both Israel and Hizbullah -- by an independent and impartial body like the International Humanitarian Fact-Finding Commission (IHFFC). The Israeli investigation into the killings of civilians in Qana, where at least 28 people sheltering in a building were killed in an Israeli strike, lacked any credibility. According to an eye-witness who was interviewed by Amnesty International delegates in Lebanon, the Israeli forces launched two air strikes against a farm in al-Qaa on Friday. The workers, most of them Syrian Kurds and who included at least five women, packed and processed fruits for export on the farm. The witness said he saw the first explosion from the roof of his church compound. As he prepared to go and help, another explosion followed five to seven minutes later. He said he saw 22 bodies being pulled out. An Israeli army spokesperson said the attack was directed at the suspected transfer of weapons by Hizbullah from Syria. The information gathered from Amnesty International delegates from eye witnesses and footage of the scene show no evidence supporting the Israeli army allegations. The attack appears to have been indiscriminate or disproportionate and as such a war crime. Since Friday, Israeli forces have again pounded civilian infrastructure in Lebanon, cutting off one of the last remaining vital routes for international humanitarian aid. At least 45 civilians are reported to have died in the attacks, including those killed in al-Qaa raid. Israel warned residents in the southern Lebanese city of Sidon to evacuate the city ahead of planned air strikes on Hizbullah targets by the Israeli army. The Israeli army dropped leaflets around the city warning all residents to leave. Repeated Israeli strikes against the civilian infrastructure have forcibly displaced hundreds of thousands of civilians, and are threatening to displace other tens of thousands in Sidon who have been forcibly displaced from villages in the region. This new call for evacuation cannot mean that Sidon should be regarded by Israeli forces as a "free-fire" zone or a military objective. Along with the pattern of warnings to civilians in the south Israeli forces are making it difficult for such civilians to leave by destroying roads and bridges and targeting convoys. Such actions result in the spreading of panic and terror rather than increasing the protection of civilians. Hizbullah officials have described the group's rocket attacks against Israel as reprisals for Israeli attacks on civilians. Amnesty International considers these attacks unlawful, and constituting direct attacks on civilians and as such war crimes. Amnesty International urges the United Nations Security Council which is currently debating a draft resolution on the crisis to call for an immediate, full and effective ceasefire to protect civilians in Lebanon and Israel. The Council must also demand that the parties to the conflict immediately take all measures necessary to allow delivery of humanitarian aid to persons affected by the hostilities. As it deliberates on its next steps, the Council should address the failure of the parties to the conflict to respect their obligations under international law and how to establish accountability for that failure. Tags for this entry: Lebanon, Israel, Amnesty International. What do Mel Gibson's drunken, venomous anti-Semitic remarks and loving others as ourselves have in common? 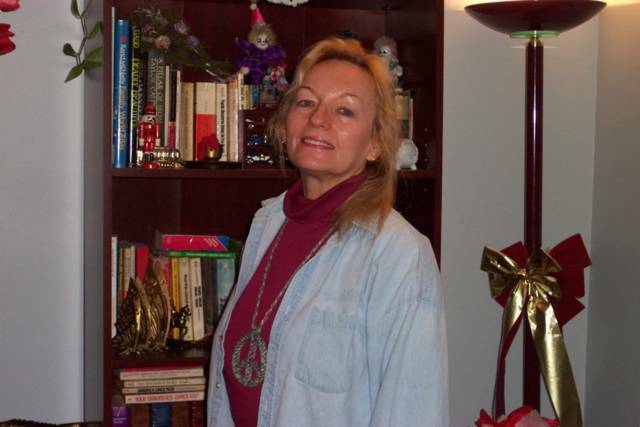 Read this wonderful article by free-lance writer and Vermont columnist Joyce Marcel. Instilling and flaming a fear of "The Other" has been the time-honoured way for rulers, politicians, religious leaders and others seeking power to control their followers. This still holds true today. Fear of "The Other" is drummed into our ears as soon as we are able to hear, and we are being taught to hate a long list of people and groups. By demonizing "The Other", we also dehumanize them; so it's okay to kill them, they are different, they are not like us. The Arabs. The Jews. The homosexuals. The Mexican immigrants. If you can lump together any group of people - a religion, a nationality, a color, a tribe - and hang on them one epithet, then you can dismiss, dehumanize and possibly start to eliminate them. It's how genocide starts. Just ask a Hutu or a Tutsi. The Other is a concept as old as mankind. This is the Press Release and a photo of the candle-light PEACE VIGIL we held in Brampton on Monday evening, August 7th. I was one of the main organisers of this event. Who: Amnesty International members, supporters, friends and partner organizations and the Brampton Peace Coalition. 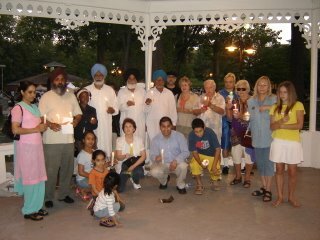 On the evening of Monday August 7, 2006 at dusk approximately 30 supporters gathered at the bandstand in Gage Park to hold a vigil for peace. 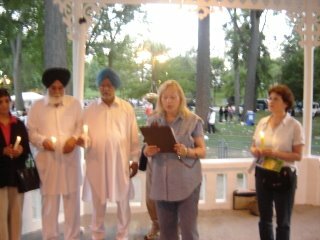 This event was part of a world- wide vigil for peace sponsored by Amnesty International. In past weeks we have seen the catastrophic events of the conflict between Israel and Lebanon unfold and magnify into a devastating series of violent atrocities and war crimes. We hear of the hundreds of lives lost, the homes destroyed, the many thousands made homeless, families torn apart and livelihoods crushed. We call for an end to this senseless violence. We stand together with a simple message: For all our sakes, ceasefire. I came across this appeal by Jews for Justice in the Middle East, a group of American Jewish people who oppose the politics of Israel and its oppression and killing of Palestinian and Lebanese people. The writers are urging Jews of conscience -- in the U.S. and elsewhere -- to join and support all Jewish Peace groups who are calling for just, equitable solutions to the root causes of the present conflict in the Middle East. I have shown CONCLUSION I below. A link to CONCLUSION II follows at the end of the article, and it is also available for reading here. Their very interesting, informative booklet: "The Origin of the Palestine-Israel Conflict" is available to read online here. You can download parts of it it in PDF format if you wish, FREE OF CHARGE. A link is also availabe at the foot of the article posted here. In order to better understand the ongoing conflict -- and the present catastrophe -- I urge everyone to read this booklet in its entirety. You will find all the links below. We know it is hard to accept emotionally, but in this case the Jewish people are in the wrong.We took most of Palestine by force from the Arabs and blamed the victims for resisting their dispossession. If you run into someone's car, for whatever reason, simple justice demands that you repair it. Our moral obligation to the Palestinian people is no less clear. It is time for all Jewish people of good conscience to make whatever amends are possible to the Palestinians in order to live up to the best part of the Jewish tradition - its ethical and moral basis. Israel's long-term interests can best be served by supporting Israeli peace groups, like Gush Shalom (www.gush.shalom.org), not the Israeli government and its brutal repression, which just leads to endless violence. Israeli peace groups rightfully criticize their government and we should too, since they claim to act in our name. American groups like the Jewish Peace Lobby, Jewish Voice For Peace and the Middle East Children's Alliance also deserve your support. Don't compromise yout ethics in blind support of bad politics--work for a just soultion instead. Important Note: at the end of the next section, ConclusionII, there is a list of Jewish organizations in America and Israel, and links to their websites, which are informative and interesting. We encourage to explore them with an open mind. Click on the next section you wish to read. The idea that you can solve social and political problems militarily from the air is, on the face of it, ludicrous. The historical record is filled with the dead dreams of air power solutions to ground-based problems. But that stops no one. Just yesterday, for instance, as part of the new American operation to -- somehow -- seize control of the situation in civil-war wracked Baghdad, American forces launched an attack on Muqtada al-Sadr's Mahdi militia in the capital's heavily populated Shiite slum, Sadr City. As a Bloomberg News Service piece put headlined its piece: "Iraq, U.S. Forces Raid Sadr City to Calm Baghdad." Aha. "Calm," it seems, was to be imposed not just by ground troops but from the air by helicopter assault (though even the best accounts of the operation offer few details on just what those helicopters did). We do know that this calming raid managed to kill three people, including a woman and a child, wound others, and destroy three homes. It also left the Iraqi Prime Minister a good deal less than calm. Simply firing into urban areas this way should be considered inconceivable rather than, as now, a problem-solving approach to the disaster that is Baghdad. In Lebanon, here's what "precision" bombing seems to mean. "On Saturday, an Israeli offense consisting of more than 250 air attacks dropped 4,000 bombs within seven hours… The total death toll from the attacks is approaching 1,000. One third of those deaths are from children under 12." I don't know who is counting all this or whether such figures are accurate, but there can be no question that parts of Lebanon are being turned into little more than rubble; that with main highways and bridges destroyed, unmanned aerial drones and F-16s overhead, airports shut down, and the coastline blockaded, supplies are not arriving; that hospitals are at the edge of closing, and that a staggering percentage of the country of only 3.8 million are now refugees -- abroad, in Syria, or simply on the move and homeless in their own country. Christian areas of Lebanon are now being bombed -- for this, see a vivid, and horrifying post by Juan Cole -- and the bombing campaign is widening with, for instance, ever more central areas of Beirut being hit. It seems that even some Israeli pilots are having qualms about the targets being offered. The message is, I suppose, precise enough, even if the bombs and missiles aren't: Nowhere is safe; there will be no refuge. In Baghdad as in Lebanon, this, it seems, is where the Bush "crusade" has indeed left us all. It's a place without pity or, evidently, a shred of mercy. It is no place for diplomacy, nor even for words (so much more precise and yet frustrating than bombs). Hezbollah's "words" are, of course, its rockets which land indiscriminately across northern Israel. And our President? He's evidently unfazed by the spreading chaos in the Middle East (and perhaps sooner or later in our wider world). Recently, Steve Holland, a Reuters correspondent, took a more than vigorous bike ride with Bush around his Crawford vacation home. ("'Riding helps clear my head, helps me deal with the stresses of the job,' a sweat-soaked Bush said after an hour-and-20-minute ride that shot his heart rate up to 177 beats per minute at the top of one climb.") Holland reports that the occasion for the ride was the President's sense that "a U.N. resolution on southern Lebanon was essentially complete." George Bush, it turns out, does not bike in silence. Here's an example of his bike-riding exclamations. Think of it as well as a presidential Rorschach test: "'Air assault!' he yelled as he started one of two major climbs, up Calichi Hill, which he named for the white limestone rock from which it is formed." Damascus, Syria -- "I care about my people, my country, and defending them from the Zionist aggression," said a Hezbollah fighter after I'd asked him why he joined the group. I found myself in downtown Beirut sitting in the backseat of his car in the liquid heat of a Lebanese summer. Sweat rolled down my nose and dripped on my notepad as I jotted furiously. Tags for this entry: Lebanon, Israel, Syria. In this latest dispatch from Lebanon, independent journalist Dahr Jamail writes about the growing popularity of Hezbollah in Lebanon and the Arab world. Israel's aim of widespread bombing of Lebanese infrastructure - and the rising civilian deaths - in order to create resentment against Hezbollah seems to have backfired, creating the opposite. The Israeli aim of widespread bombing of the Lebanese infrastructure in order to create resentment against Hezbollah seems to have played into the strengths of Hezbollah. Hezbollah, known in many western countries as a "terrorist organisation", is widely seen in Lebanon as a legitimate political and social power. One reason for this, according to an official representative of Hezbollah and member of the Lebanese Parliament, is that Hezbollah has never aimed to turn Lebanon into an Islamic state. "Hezbollah is a democratic party whose principles are based on the Lebanese constitution," Tarad Hamade told IPS. "This means we have to respect the cultural and religious diversity in the country. We have never intended to establish an Islamic state." Hamade, who is also labour minister, said: "Israel wants to terrorise the country and inflict as much damage as possible. They call us terrorists, at the same time as they are exercising state terrorism. Are they not terrorists?" More and more Lebanese are beginning to hold this view. Lebanese see the destruction by Israelis all around them. The damage to the civilian infrastructure will cost billions of dollars to fix. All three of Lebanon's airports and all four of its ports have been bombed. Damage done to houses and businesses is estimated at above a billion dollars. At least 22 fuel and gas stations have been bombed. Scores of factories have been damaged or destroyed. Red Cross ambulances, government emergency centres, UN peacekeeping forces and observers, media outlets and mobile phone towers have been bombed -- all in violation of international law. Mosques and churches have been bombed, and illegal weapons such as cluster bombs and white phosphorous used. More than 90 percent of those killed, close to 1,000 according to official estimates, are civilians. The result is that rather than pressuring Hezbollah by destroying Lebanon, Israel has increased popular support for the group, and brought the wishes of most Lebanese more in line with the stated goals of Hezbollah to keep Israel at bay. With Hezbollah engaged in at least 60 percent of the relief efforts in Lebanon, the kind of work that gave it power in the first place is now only increasing its popularity. Israel could also have fallen for the military strategy of Hezbollah. Hezbollah would like nothing more than to engage the Israeli military in a guerrilla war in southern Lebanon - and this has begun already now that Israeli troops are in the south, and suffering casualties. Hamade says Hezbollah's stated demands for a ceasefire are simple and have remained unchanged since the beginning of the conflict. "There can only be ceasefire if Israel stops firing as soon as possible, accepts an exchange of prisoners and leaves Lebanon." But more than 10,000 Israeli troops now occupy parts of southern Lebanon, widespread air strikes continue, and Israel refuses a prisoner exchange. IPS recently interviewed a Hezbollah fighter who asked to be called "Ahmed". The Israeli aggression has only made him a more determined fighter. "I care about my people, my country, and I'm defending them from the aggression," he said. "My home now in Dahaya (southern Beirut) is in ruins. Everything in my life is destroyed now, so I will fight them." Like most followers of Hezbollah leader Hassan Nasrallah, Ahmed said: "We are all with him. He has given us belief and hope that we can push the Zionists out of Lebanon, and keep them out forever. He has given me purpose." He added: "We are like the French resistance against the Nazis." Mohamed Slaibi, a 21-year-old business student at the American University of Beirut (AUB), said that he has never supported Hezbollah, but he now feels it is their right to defend Lebanon. "And now I feel betrayed by America," Slaibi said. "The U.S. supports Israel 100 percent in everything they do. Even though my dream was to go to the U.S., and I study at AUB, now I hate the Americans for supporting Israel." This is just the kind of sentiment that Israel did not want to provoke. And it has been caused by the extent of the Israeli aggression. In the past Israeli attacks were aimed primarily at Hezbollah, but now all Lebanese people are suffering. It is well known that Hezbollah enjoys strong political support from Syria and Iran, and likely receives arms and munitions from those countries, but more than ever it is enjoying the support of the Lebanese people. And it certainly seems to have resources. "Some of it is donations from the Lebanese people," Hamade said. "Some of it is revenues from companies established by Hezbollah. In addition, Muslims pay 'Zaqaat' (a voluntary donation for the cause of religion). The arms we can buy on the market. There is an endless supply of arms." Hezbollah can of course not match Israel in weaponry. "We might not be as powerful as the Israeli army but we will fight until we die," Hamade said. Tags for this entry: Hezbollah, Lebanon, Israel. If you haven't already seen this clip - please take the time to watch it! Listen to Dahr Jamail give his Lebanon update on Mother Jones Radio. Dahr Jamail is an independent journalist who is now writing for Mother Jones' website, Inter Press Service, the Asia Times and many other outlets. His reports have also been published with The Nation, the Sunday Herald, Islam Online, the Guardian, and the Independent to name just a few. Jamail's dispatches and hard news stories have been translated into French, Polish, German, Dutch, Spanish, Japanese, Portuguese, Chinese, Arabic and Turkish. On radio as well as television, Dahr reports for "Democracy Now!," the BBC, and numerous other stations around the globe. Jamail is also special correspondent for "Flashpoints." He has spent a total of 8 months in occupied Iraq as one of only a few independent U.S. journalists in the country. In the mideast, Dahr has also has reported from Syria, Lebanon, and Jordan. British police have arrested seven anti-war activists after three of them boarded a US military transport plane at an airport in Scotland to check if it was carrying weapons to Israel, a peace group says. Anti-nuclear campaign group Trident Ploughshares said its activists had cut through a perimeter fence at Prestwick Airport, near Glasgow, on Monday and boarded a US plane to search for evidence of arms shipments to Israel. Tags for this entry: activism, Britain, U.S..
Fouad Siniora has renewed demands for a quick ceasefire with Israel and called for the immediate withdrawal of Israeli troops from south Lebanon. Choking with emotions as he described his people's suffering during 27 days of conflict, the Lebanese prime minister told Arab foreign ministers at an emergency meeting in Beirut on Monday that he remained committed to a seven-point peace plan endorsed by his cabinet. Tags for this entry: Lebanon, Israel, Middle East. The Israeli military is reportedly planning to ramp up its attacks on Lebanon by targetting more of the civilian infrastructure as well as symbols of the Lebanese government. One military official told the Israeli newspaper Ha'aretz "It could be that at the end of the story, Lebanon will be dark for a few years." Democracy Now! speaks to Catholic Relief Services representative Mark Shnellbaecher, who suggests that Lebanon could run out of fuel within the week, leading to a humanitarian catastrophe that will not be easily solved by ceasefire alone. For complete article: Listen/Watch/Read Democracy Now! Harper-Valley: "Justice Really Is Blind"
Check out this latest wonderful post on Harper-Valley blog about Justice Marshall, including the remake of the old Ray Charles tune, "Hit the Road Jack". Very witty and totally funny!!! [Tomdispatch Notes from Here and There: For those readers wondering about Nick Turse's long absence from the site, the reason is now apparent. Today, the first article in a major series he has co-authored on previously unrevealed American war crimes in Vietnam appears on the front page of the Los Angeles Times (with sidebar). When the series is finished, he will return to Tomdispatch. In the meantime, we here -- which means me, here -- at Tomdispatch are exceedingly proud of him for this accomplishment. "MR. SNOW: The President believes in the forgiveness of sins for all who seek forgiveness." First, there was one, Little Boy, which the United States dropped on Hiroshima as a bitter war was nearing its end sixty-one years ago today; then came Fat Man, dropped on Nagasaki three days later. Both cities were essentially obliterated. By the time the Russians got theirs -- Joe (for Joe Stalin)-1 in 1949, the U.S. had 235 in its arsenal. By the time Britain got its first ("Hurricane") in 1953, the U.S. had 1,436 and the Soviets, 120; by the time France had its first 4 and China its first in 1964, the U.S. had 31,056; the Russians, 5,221; and the British, 310.